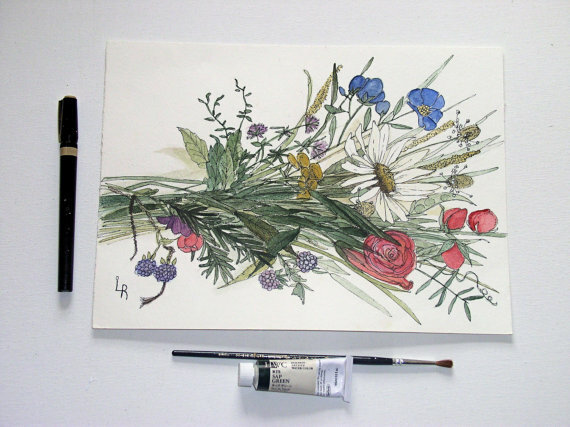 Nature Art botanical garden flowers, woodland wildflower bouquet is a watercolor original paintings on paper by Laurie Rohner. Botanical garden flowers and woodland wildflowers painted on molded watercolor paper. 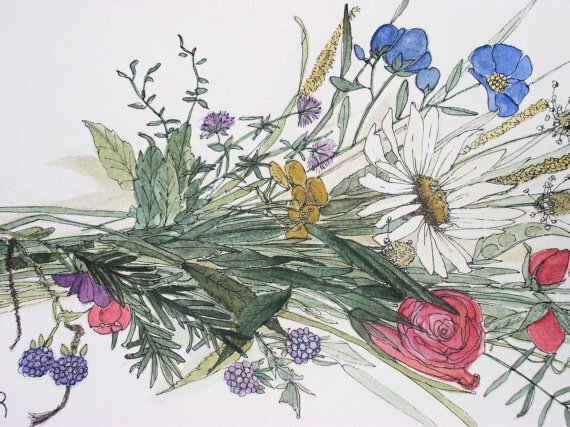 Detailed watercolor painting of a gorgeous bouquet illustration. This is an original watercolor illustration. Artwork by Laurie Rohner. Imagine a day in the countryside with the sun shining and there are flowers blooming everywhere. You know the day will end but oh the thought saddens you. So you pick a bunch of flowers for a bouquet to remember this beautiful sunny day. Think of that time every time you look at this watercolor and you can find that feeling again. It is detailed realism with a twist of whimsy and fun. Perfect to frame in a standard 8 x 10 matte opening or custom fitted in a farmhouse shabby chic cottage frame. 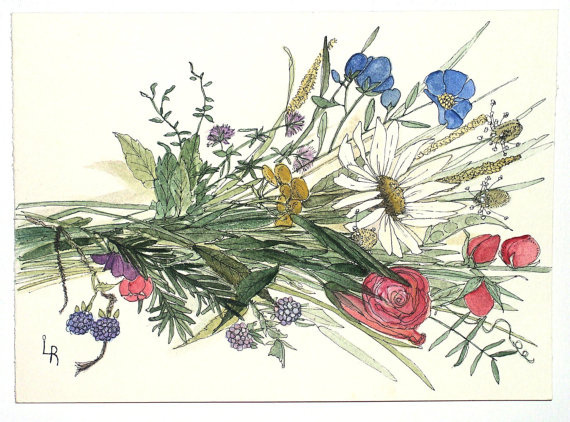 This bouquet of wildflowers has daisy,rose,sweet pea,raspberries and yarrow to name a few. Palette Colors: salmon pink, clear blue, med leaf green, light teal, light forget-me-not blue, gold yellow, deep raspberry red, soft lavender, shell pink. Arches 140lb hot pressed watercolor rag paper.